Painstaking Punctuation Saves Lives—and Business! When it comes to meaning you MUST punctuate correctly. It clarifies intent so that your readers/clients/customers get the right end of the ice pick. 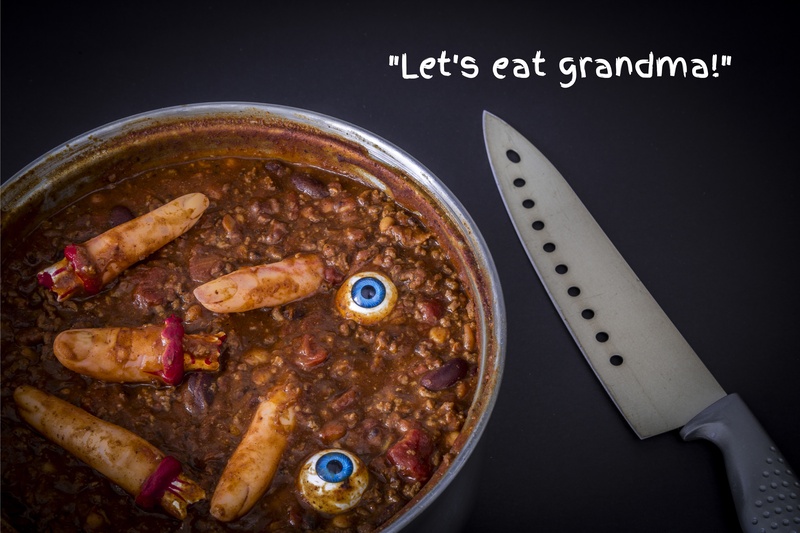 Take this title image: by adding a comma between eat and grandma, the mental image shifts from inbred, cannibalistic chow down to friendly family feast. Punctuation matters. Full stop. And will affect your company's credibility. At best, poor punctuation is dumb: There’s is no place like home. At worst, poor punctuation can change meaning: We're going to learn to cut and paste kids! Your, you’re, their, they’re, there: We’re all familiar with these examples of today’s punctuational slide, but there are equally heinous, all-too-common examples. The two negatives cancel each other to reverse the intended meaning into: We did something. Comma Splice: Thank you for contacting bandv, we’ll be in touch soon. Two independent clauses are incorrectly linked by a single comma. This can be rectified with a full point, to read: Thank you for contacting bandv. We’ll be in touch soon. As both clauses are short, this sounds a tad abrupt, so use a conjunction instead. Thank you for contacting bandv and we’ll be in touch soon. At a push, a dash will do (and make sure it’s a dash—not a hy-phen): Thank you for contacting bandv—we’ll be in touch soon. Of course, a semicolon/semi-colon is also a valid alternative. And a lot of people come unstuck when it comes to semicolons—and use a dash instead. Semi-colons divide people. "Sometimes you get a glimpse of a semicolon coming, a few lines further on, and it is like climbing a steep path through woods and seeing a wooden bench just at a bend in the road ahead, a place where you can expect to sit for a moment, catching your breath." Lewis Thomas: American physician, poet, etymologist, essayist, administrator, educator, policy advisor, and researcher. "If you really want to hurt your parents, and you don’t have the nerve to be a homosexual, the least you can do is go into the arts. But do not use semicolons. They are transvestite hermaphrodites, standing for absolutely nothing. All they do is show you’ve been to college." Then there are dangling participles, personal pronouns, split infinitives, ending sentences with prepositions, etc. etc. etc. See what we mean? Remember: Sloppy copy can lead to grisly endings—lost credibility and/or business. Or a much-loved family member. Best leave it to bandv. After all, we're a HubSpot GOLD Certified Partner Agency and Google Premier Partner, so we know our grammar insides out.